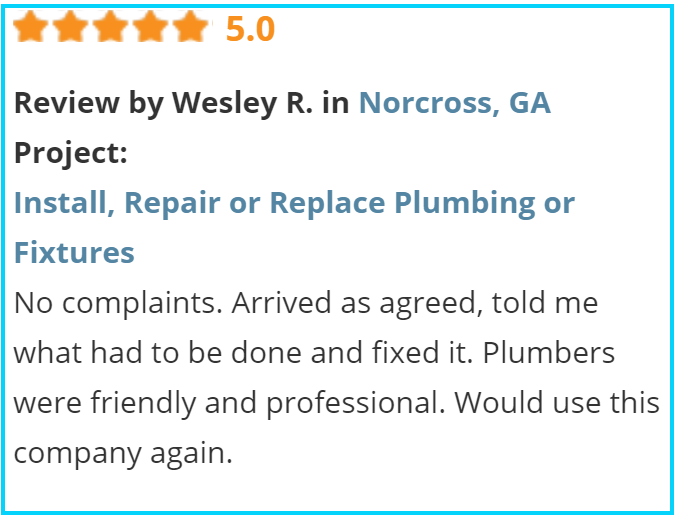 Call and speak with Master Plumber David Greene now; and get the experience, respect and courtesy you deserve when you need a professional plumber in the Dunwoody Ga area. At Valu-Rite Plumbing, We take pride in the craftsmanship of the plumbing pipe replacement jobs we do in Dunwoody and specialize in cast iron pipe, copper pipe, galvanized pipe and polybutylene pipe replacements. If you've gotten a high water bill for water usage you don't think you've used anywhere in the Dunwoody Ga area; or have water leaking inside your home, basement, crawlspace or outside in the yard; we can get you fixed up fast. We can detect the location of the leak if needed and get it fixed very quickly; and get the water cleaned up as well. We have many years experience in leak detection and repair of any type of water leak in the Dunwoody Ga area. If you hear water running or have weird humming or banging sounds within your home; call us now for a free no obligation leak detection visit to asses the situation and get your water leak stopped for good! Amazingly, in the Dunwoody Ga area; polybutylene and now copper water pipes are leaking and causing damage to home and property. Copper water pipe systems are leaking due to deterioration caused by hard water or electrolosis in the copper piping system; as well as the fact that the original plumber used a light-weight grade of copper when installing the pipe system from the start. Polybutylene plastic water pipe is still out there and still failing at an alarming rate due to inferior chemical makeup of the polybutylene (poly / PB) plastic itself in the Dunwoody Ga area. It unfortunatly isn't enough to find someone who says they can replace your cast iron or PVC drains or sewer pipes in Dunwoody. You need someone who understands fully and has great respect for the health aspects of the plumbing drain and venting system. If you smell odors within or around your home; give us a call for a free evaluation of the sewer odor issue. Your Dunwoody area home could be sinking in sewage! A sewer drain or toilet backup or stoppage can create a real disaster quick; dont wait for the bigger issue to flood your house with sewage from your neighbors. We have the experience and technology to find the cause of your sewer or drain backup or stoppage anywhere in the Dunwoody Ga area and get your drains running clear fast!